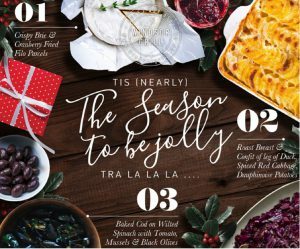 Tis (nearly) the season to be jolly…tra la la la la la…. If you haven’t booked your Christmas party yet, don’t panic. We are here to help. Whether you choose our Crispy Brie & Cranberry, Fried Filo Parcels, Micro Herbs; Roast Breast & Confit of leg of Duck, Spiced Red Cabbage, Dauphinoise Potatoes; or our Baked Cod on Wilted Spinach with Tomato, Mussels & Black Olives, we are sure you will have a lovely time as guests in our restaurant. If that wasn’t enough, we aren’t like other restaurants where we insist that you choose what you’d like to eat beforehand. We cook everything fresh so you can decide what you want when you’re here. Give us a call on 01753 859 658 and one of the team will be happy to talk you through the options.